Albert ascended the throne on the death of his uncle, Leopold II, in 1909, due to the death of the intended heirs. Leopold's son died, then his nephew, which left Albert to reign at 16 years old. He was reserved, an avid reader and loved the outdoors. His interests included horseback riding and rock climbing. Before becoming King he was Count of Flanders and was very popular because of his democratic ways. He married the Duchess of Bavaria, Elizabeth. She was as loyal to Belgium as he. He visited the US in 1898 and 1919 and also visited the Congo, where upon seeing the poor condition of Leopold II's former colony, he urged technological development and better treatment of the natives in the area. Albert and his wife were well-liked as a royal family. They had a model family and acted like real people. Albert was aware of the German invasion plans, but could do nothing, as Belgium's neutrality prevented the country from arming itself. 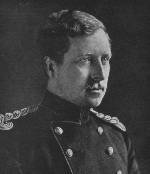 But once the war had begun, he led the Belgians in delaying actions against the Germans (the Belgian constitution said the King would become Commander in Chief in case of war). The King declined to cooperate with the allies and maintained separate command of the Belgian forces. In 1918 Albert finally gave in to pressure and cooperated with the allies in the final offense of 1918, being made commander of the Flanders Army Group by General Foch of France. He died in a mountain climbing accident near Namur and was succeeded by his son Leopold III, who would face the Nazis in World War II. Albert's death was mourned universally. "Belgium is a nation, not a road." "When he speaks, the King always looks as if he wished to build something." "What does he take me for?" "One thing is for certain: they will not say that Belgium invaded Germany."